One great thing about WordPress that makes it an excellent choice – for building websites – is its inherent SEO features, which increases your website “visibility” among target audience. Besides, there are many useful plugins (available in the WordPress Plugin Repository) that once installed helps in increasing the search engine capabilities of a WordPress site. However, the default WordPress permalink structure is nasty and can have a negative impact on your website search engine rankings. Permalinks are basically the URLs of a WordPress website pages or posts. In a layman’s term, permalinks are what online surfers enter into the address bar of their browser to access your website. Most importantly, search engine give priority to sites for indexing that contain SEO-friendly permalinks. You can change the default structure of your permalinks as and when required, however, it also changes your pages/posts URL. And so, your visitors will encounter 404 page errors, when they use your old URL to view your pages, resulting in sudden drop in search traffic. Although 301 redirects can help resolve the problem that crops up because of the changes made in your permalink structure, however, a better alternative is to configure your website with your choice of permalink structure. The default permalink structure of a WordPress site does not make semantic sense. Below is an image displaying five custom permalink structures that you’ll find under common settings in a WordPress website admin area. By default, WordPress enables the default permalink structure automatically once you’ve finished installing the WordPress platform on your system. 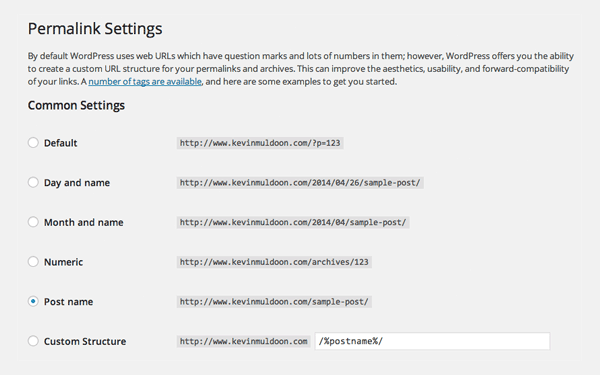 The number (or you can say, the ID) included in the default permalink tells WordPress about the location of content in your website database. For example, http://www.yourdomain.com/?page_id=23 would refer to the page with the ID number 23. But, this is not a user-friendly permalink. It would be much better of you’ll make your visitor refer to a permalink such as: http://www.yourdomain.com/improving-wordpress-permalink-structure. That’s because, a user can easily easily guess the post name that he might be interested in visiting. On the other hand, merely using a “page_id=23” is something that neither humans nor search engines can understand. Post Name (/%postname%/): This is one of the most preferred structure tags used by WordPress site owners, since it helps in generating short and memorable URLs. Day and Name (/%year%/%monthnum%/%day%/%postname%/): This permalink structure perfectly suit the needs of websites that requires to publish content multiple times a day, such as new websites. After all, using day and name in the permalink structure can help users easily figure out the day a particular article was published. Category and Name (/%category%/%postname%/): If you’re running a content-heavy site, then you would certainly want to create a hierarchical structure to present your website content. This is because it will help your visitors know about the category they’re viewing. And most importantly, this structure tag when used in your permalink structure help in adding maximum keywords into your URL compared to all other structure tags. And so, this is the best option for permalink structure from SEO point-of-view. Month and Name (/%year%/%monthnum%/%postname%/): This is another great choice that can be used in your permalink structure. This is just like the day and name structure tag, however, it helps produce URLs containing shorter characters compared to the day and name structure. Custom Structure: In this field, you can enter your choice of permalink structures. For example, http://yourdomain.com/%postname%/. Hour (%hour%) – It tells about the hour when a post was published. Second (%second%) – Identifies the second when a post was published. Minute (%minute%) – Minute when a post was published. Author (%author%) – It determines the name of the author of the published post. Note: In case, you’re running WordPress version 4.2, then you don’t have to worry much about setting the permalink structure, since it comes with a function that enables pretty permalinks automatically – except that your server must support that function during installation. But, if you’re running an older WordPress version, you can create pretty permalinks by including the “post name (%postname%)” or the “post ID (%post_id%)” in your permalink structure. Since both these structures provide most accurate description of your website content, they can be easily be easily understood by humans and search engines alike. Your WordPress site permalink structure is basically the URL of your site that your customers use to view your web pages or posts. When choosing or creating a permalink structure, make sure to opt for one that is SEO-friendly. In case, you are running a new website or any other site that publishes many different articles in a single day, then it is recommended that you should use the day and name option. But, for anything else you can either use ‘post name’ (/%postname%/) or ‘category and name’ (/%category%/%postname%/) options. Lastly, remember if you want to stuff more keywords in your website URLs, then adding categories into your WordPress site post URLs can help in increasing your search engine ranking. Choosing Ava Garcia can serve as the best option if you’re looking ahead to hire WordPress developer for meeting your website development needs. When not busy developing WordPress website, she likes sharing her knowledge about all the recent advancements in the world of WordPress development.